The Korina, The Victoria, The Milina, The Corindi, The Akarra IV win “Best Overall” in addition to Cannon’s 27 Individual awards. The Akarra IV, The Corindi, The Talia, The Walara and The Victoria model homes win “Best Overall” in addition to Cannon’s 27 Individual awards. SARASOTA, FL (March 2, 2018) – Southwest Florida residential luxury custom home builder John Cannon Homes swept the competition with five “Best Overall” awards and an additional 27 awards in individual and sub-contractor categories at the 2018 Parade of Homes Ceremony held Thursday evening at The Hyatt- Sarasota. SARASOTA, FL (March 3, 2017) – Southwest Florida residential luxury custom home builder John Cannon Homes received four “Best Overall” awards and an additional 23 awards in individual and sub-contractor categories at the 2017 Parade of Homes Ceremony held Thursday evening at The Ritz-Carlton, Sarasota. SARASOTA, FL (February 28, 2017) - John Cannon Homes continues to prove to be southwest Florida’s recurring Best Builder taking home the Sarasota Herald-Tribune Readers’ Choice award in the Residential category for an unprecedented 25th consecutive year. John Cannon Homes of Sarasota, has won “Best Of Design” on Houzz®, the leading platform for custom home building design and home remodeling. 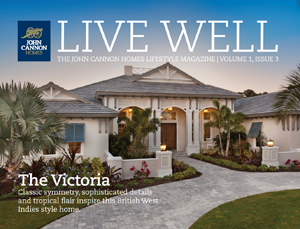 John Cannon Homes, Sarasota and Manatee area’s leading custom home builder was chosen by the more than 35 million monthly unique users that comprise the Houzz community from among more than one million active home building, remodeling and design industry professionals. SARASOTA, Fla., Oct. 21, 2015 -- With the opening of "The Mindera," a $2,299,990 luxury estate, custom-design homebuilder John Cannon marks his return to Newland Communities in Apollo Beach, Fla., as the exclusive builder in the Bay Estates Preserve at MiraBay, a neighborhood of estate-size waterfront and preserve home sites. The model will feature three bedrooms, three bathrooms, a great room, dining room, kitchen, study, and a bonus room spread over 3,442 square-feet. The house also has a three-car garage.